Recently I came across a video from a fellow YouTube Mom who demonstrated the Montessori way of teaching place value through layered cards. So I got inspired and stayed up a little bit late to make a set of my own. 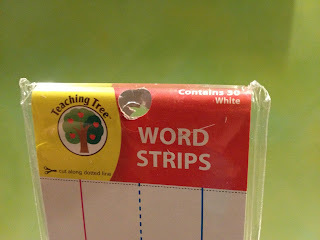 I happened to have a few stacks of blank "Word Strips" from the Dollar Tree laying around. 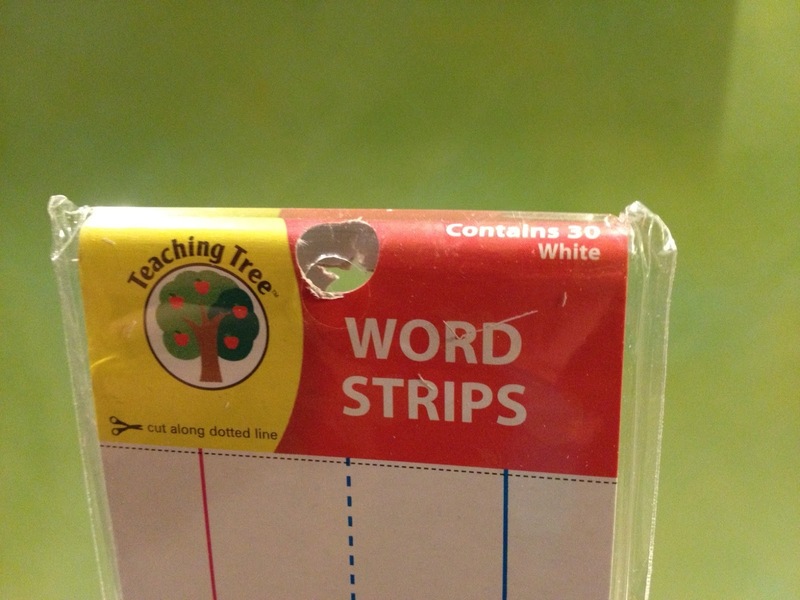 They have traditional lines on one side and they are blank on the other. I chose to use the blank side because I figured it would be less distracting. You can cut your own cards from cardstock or posterboard, but I found it to be much easier to just have to cut the length. Initially I thought about nice they would be if I printed them in color on the computer, used my paper cutter (which is packed away at the moment), laminated them, etc... and then I realized that a DONE project is better than a PERFECT project! So I whipped it out in just an hour or two and while it's not perfect, it's still effective and that's what matters. I color coded mine in Do Re Mi colors since my kids are already familiar with the sequence and I figured it would help them remember the order better. The cards weren't long enough for some of the bigger numbers, so I wrote on them first and then used packing tape to tape them together. They are relatively sturdy. I included a small chart to set next to it to simplify reading the columns. My kids knew some of these already, but not up to a million. We have a spiral flip chart where all of the numbers are already connected, but this way of layering them is just more child friendly IMO. They can see everything at once and grab whatever they need, versus only being able to see one number at a time on the chart. Here's a link to the original video from YouTube Super Mom EarlyLearningAtHome who inspired me to make these cards. She is sooooo crafty, I'm sure you'll enjoy browsing her channel as much as I do! Now I pay more attention for my time management, that's why I hire a high-qualified writer from http://professionalessayuk.com, who makes my writing tasks. I like this post, And I guess that having fun to read this post, they shall take a good site to make a information, thanks for sharing it with us.